Travelling with 2 kids at different stages of life can be a challenge…now imagine travelling with 6 kids ranging from 11 to 17. Well, that’s what we decided to take on as our ‘2017 Winter-Escape Challenge this year. 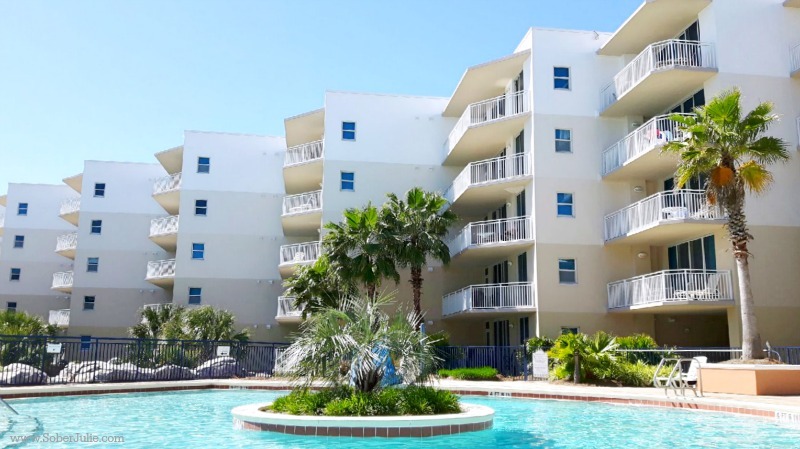 We were on a mission for a condo rental in Florida! My family teamed up with 2 other families, yup that’s 12 of us all together, and planned an epic Florida vacation. 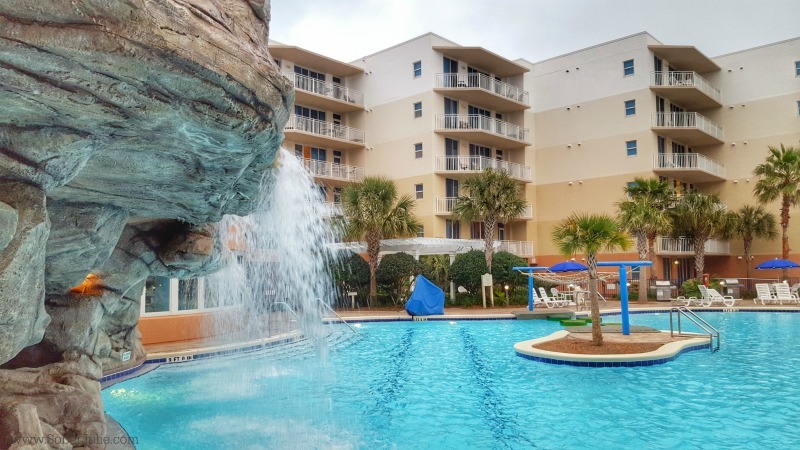 For the first 4 days of our adventure, we were blessed to stay at Waterscape Condominiums by Resort Quest Wyndham Vacation Rentals in Fort Walton Beach, FL. 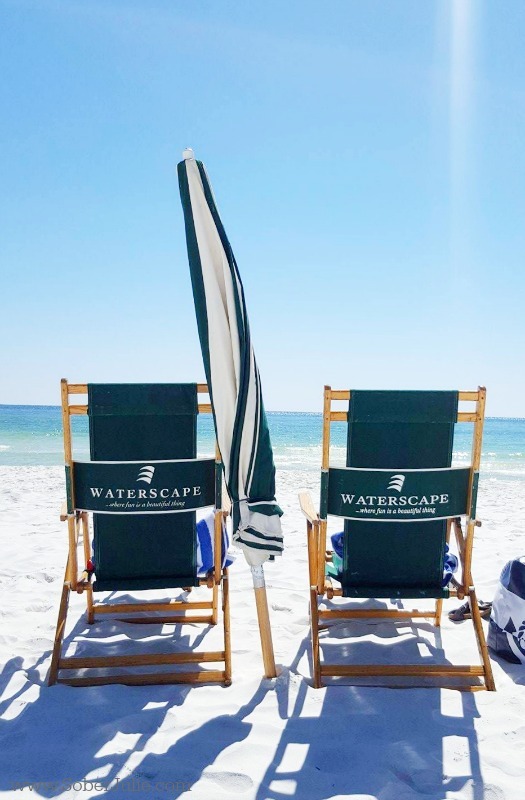 Waterscape condo units are right on the water – right on the gorgeous Emerald Coast. 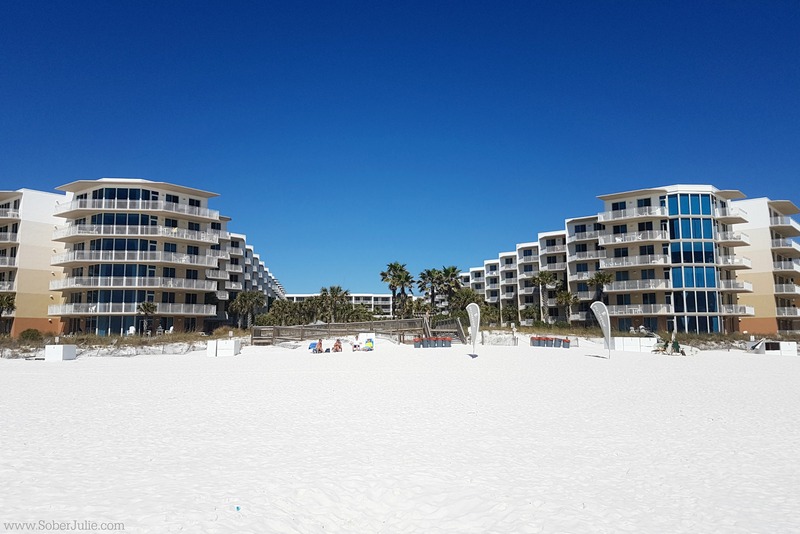 Following that, we headed over to a large home in Destin Pointe Homes Resort which is also managed by Resort Quest Wyndham Vacation Rentals….make sure to head there to check out our experience. 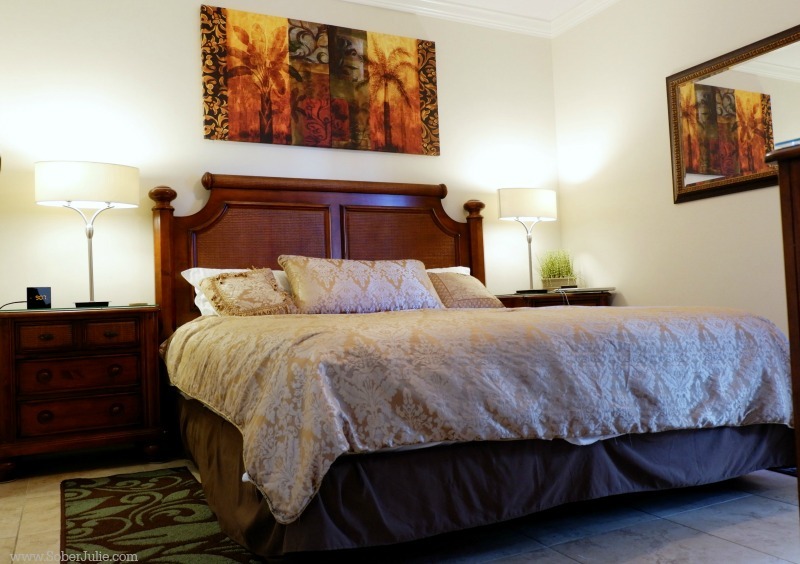 One of the challenges that arises when travelling with 3 families is arrival times – All of us were arriving in Florida at different times of the day. 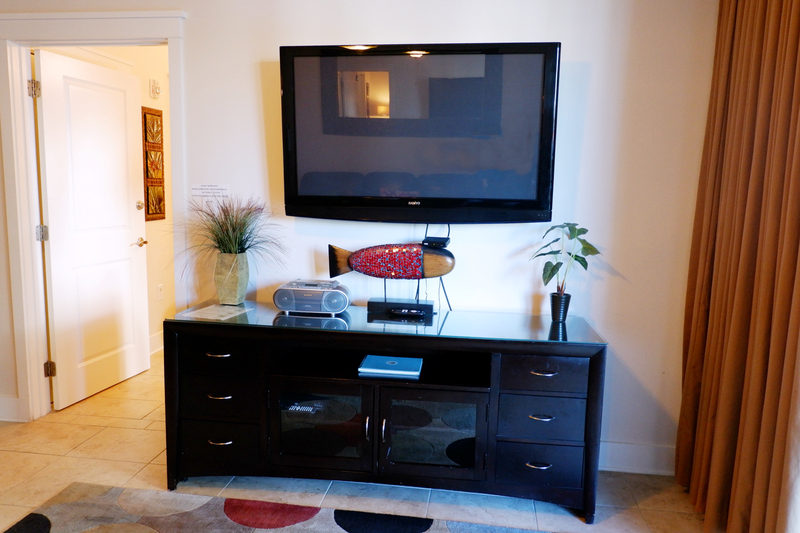 This is the first of many great things about the Waterscape Condominiums…Their front desk is open until 4pm, but if you are arriving later than that (as all of us did), the after-hours check-in process is seamless and easy! Even when I arrived at midnight, with a quick phonecall to the 24-hour customer service line, I was in my condo in minutes! Another thing that made the stay so easy was the fantastic service from the entire team at the front desk. They directed us to anything we needed and suggested we download their free app (available for both Apple and Android) which gives you EVERYTHING you need to know about your stay! And the entire property has excellent free WiFi which is available in your rooms, down by the pool as well as in the lobby. There are 3 buildings of Condos (A, B, & C) and the property is just gorgeous. 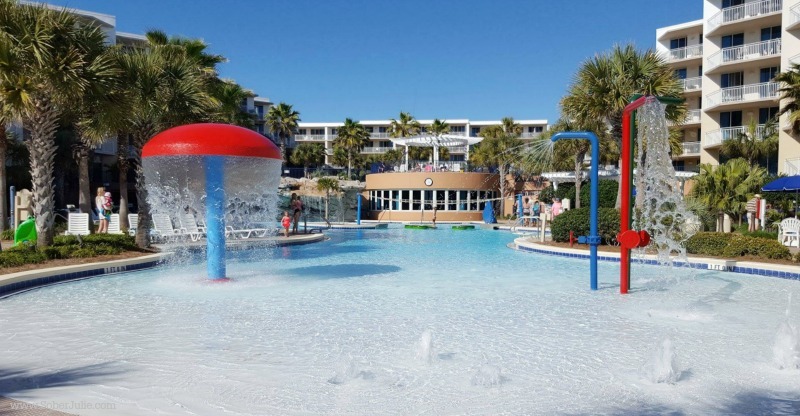 There are 3 pools as well as a lazy river and a great splash pad for younger children. 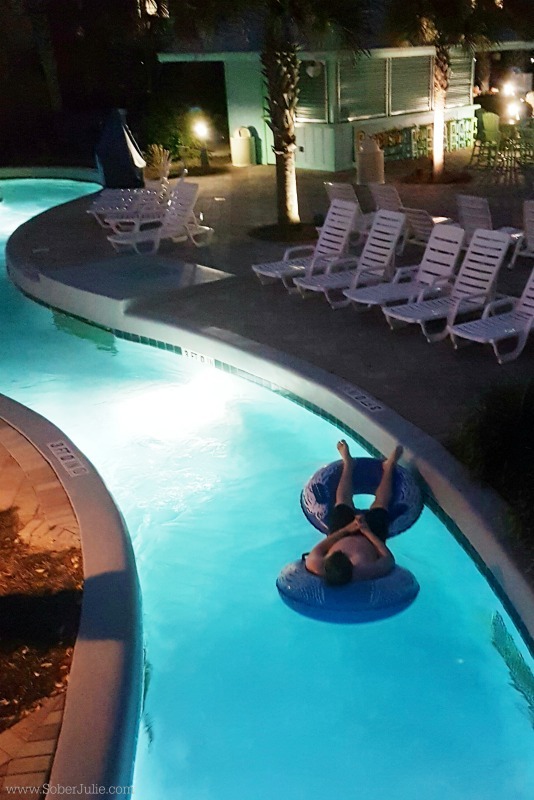 Each pool is surrounded by BBQ’s, which made making dinner a treat – the kids played in the pools and lazy river while the adults congregated by the BBQ. Other amenities include 2 hot tubs and a 24-hour Fitness Centre. 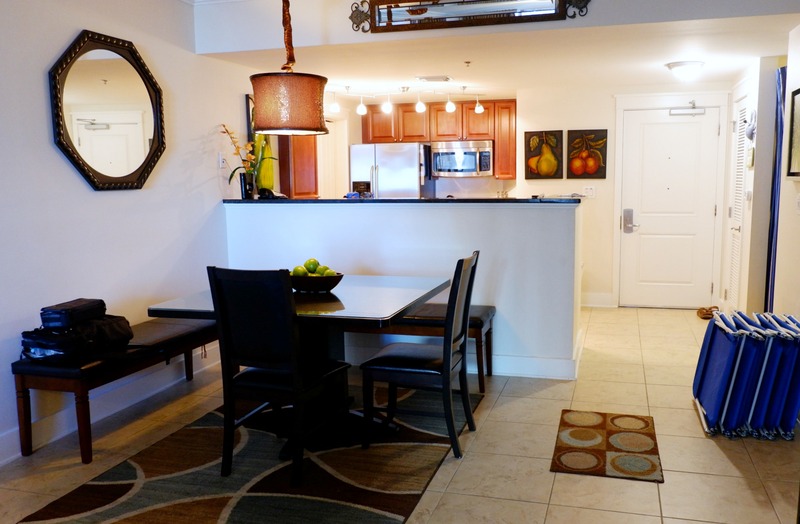 Condo units are available in every size and price to suit your family needs and budget. Two of our families were in Building A (on the 3rd and 4th floors) while my families’ unit was in building B on the ground floor. One of our favourite things about these units was that there was no need to carry keys! Each unit has a lock pad with a code – which each family member saved to their phones so we weren’t worried about the kids losing any keys! 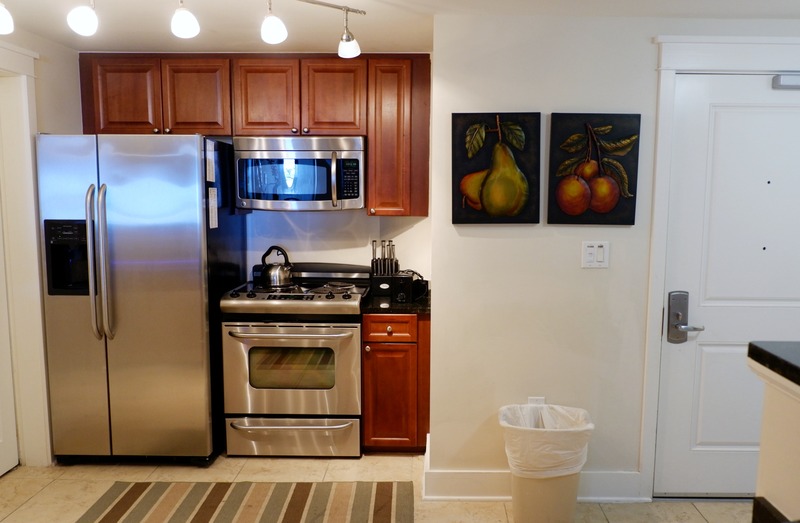 The units are clean and quiet and I can attest to the fact that the 2 bedroom units have more than enough space to comfortably fit a family of 6. 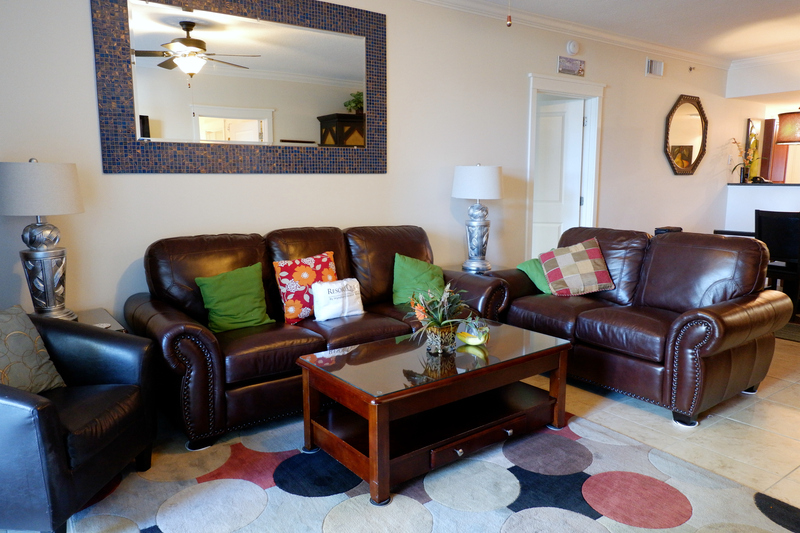 The master bedroom has a nice comfortable king sized bed, TV and door to the outside patio. 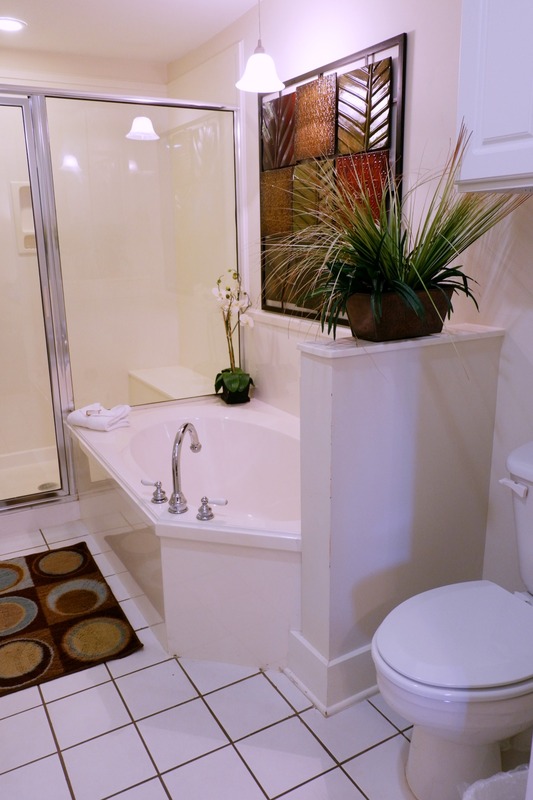 There is also a massive ensuite bathroom with walk in shower and this tub! The 2nd bedroom also has a comfortable bed, TV and ensuite bathroom which is MASSIVE. 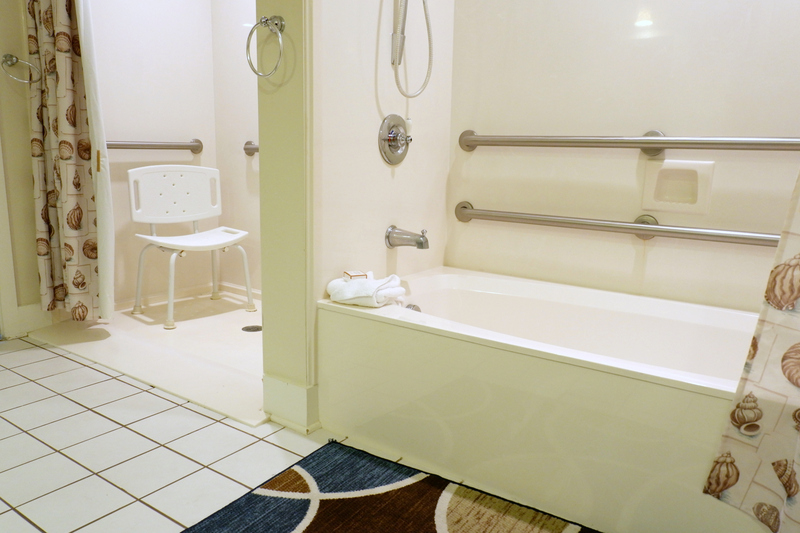 What impressed me the most about this unit, was that entire condo, including the ensuite bathroom was 100% wheelchair accessible – so nice to know that if your family has special needs, Waterscape Condominiums can accommodate! 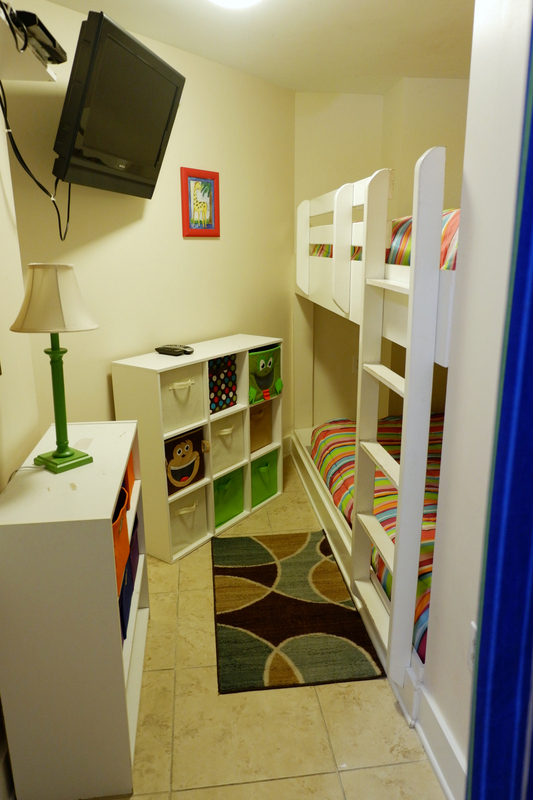 There is also a great little nook with bunk beds and a TV that quickly became the girls’ favourite hangout! The kids also loved that they got free movie rentals as a part of our rental – a card came with our welcome package and there were several places throughout the complex with easy-to-use rental machines. The kitchen, dining room and living room provided a great open-concept space that allowed for us to easily prepare large breakfasts for all 3 families. 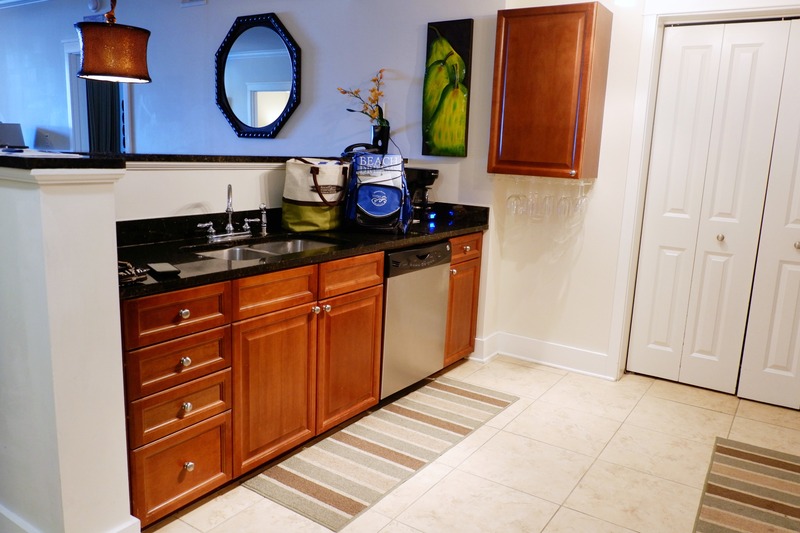 The kitchen is fully stocked with plates, cups, utensils, pots, pans, BBQ utensils, Coffee Maker, blender and everything you need to feel like you are at your home away from home. 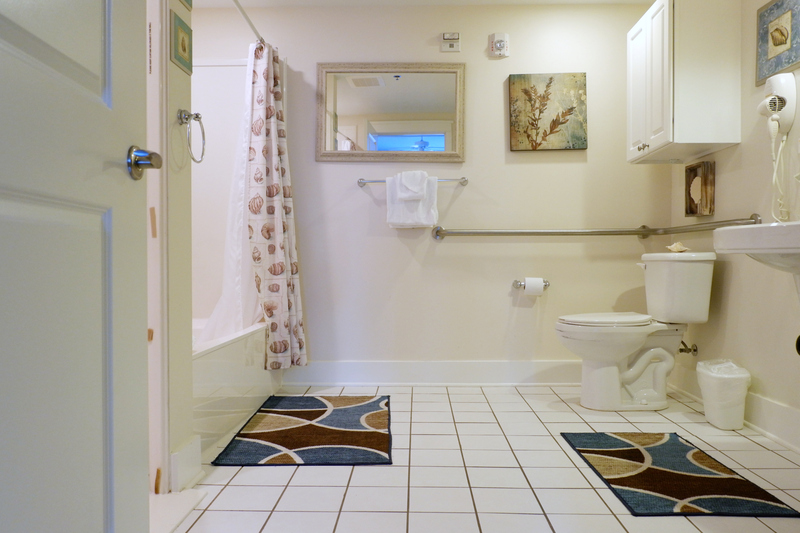 The other 2 units are as pictured below – Both units are in building A and each had one bedroom, 2 bathrooms, a private nook with bunkbeds as well as a pullout couch in the living room. The full kitchen and dining room areas were beautiful open concept spaces with more than enough room to accommodate a family of 4-6 comfortably. Now let’s talk about the beach! A quick walk over a boardwalk takes you directly to the most beautiful white sand and turquoise water. 2 beach chairs and an umbrella are included everyday with your rental. Others are available to rent should you need them. 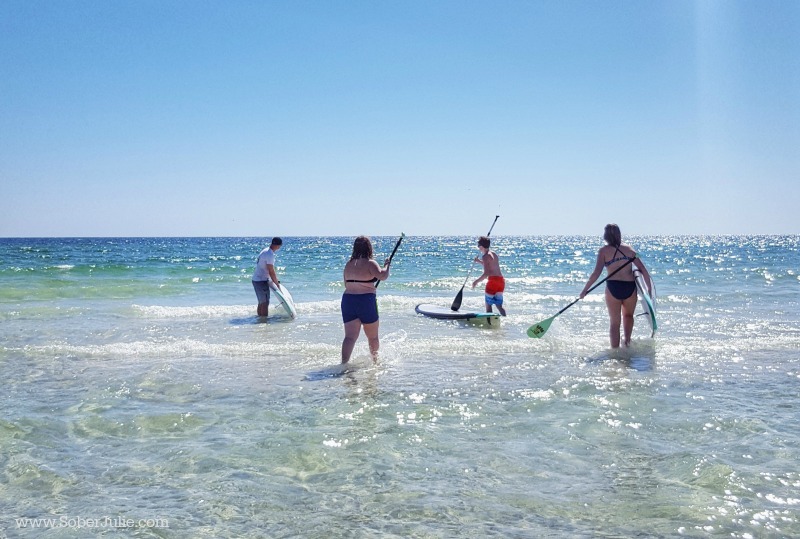 As a guest at Waterscape, you have the opportunity to rent paddle boards. The kids jumped all over that! 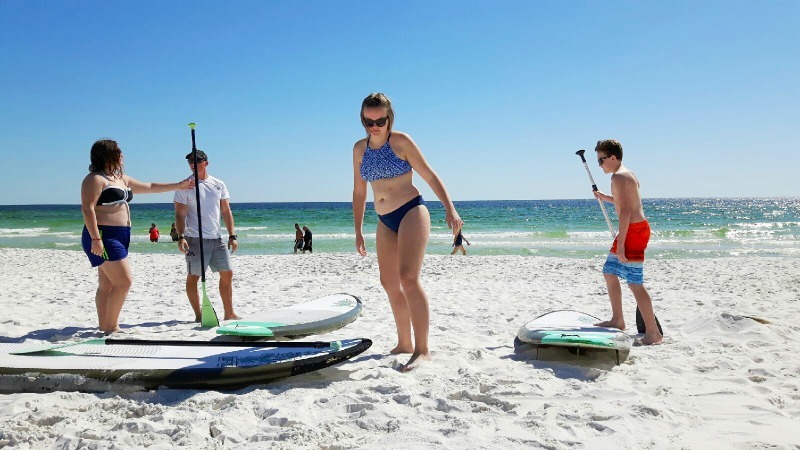 The service was fabulous – the boards were brought right to our spot on the beach and the staff member in charge of rentals even took some time to teach the kids some tricks of the trade. 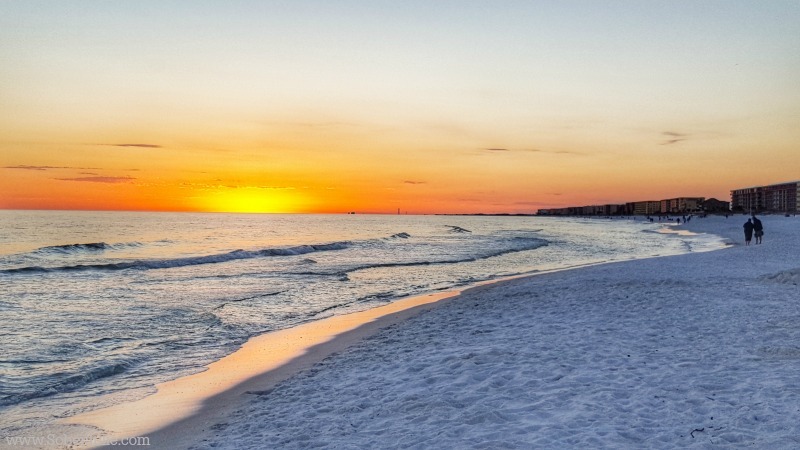 The sunsets on the Emerald Coast are just spectacular. We made sure to head down the boardwalk to the beach every night so as not to miss them! 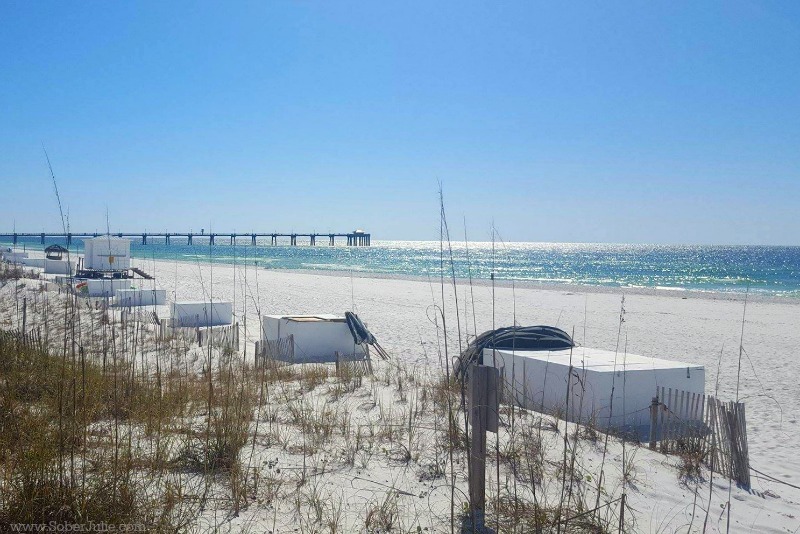 In all of my travels, I don’t know that I have been able to find a beach as beautiful as the beaches along the Emerald Coast. 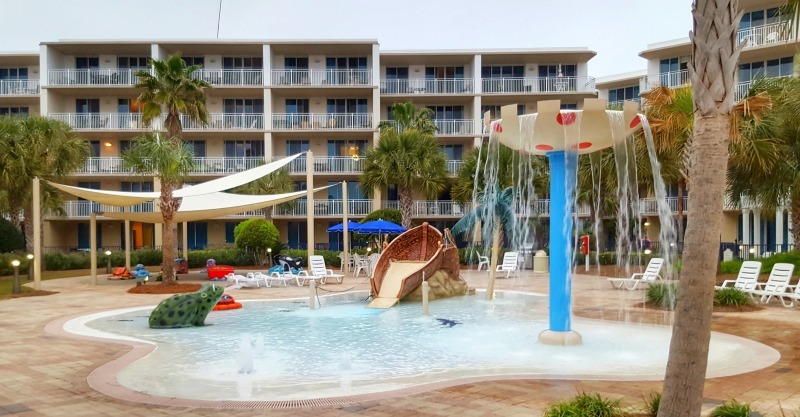 If you are looking for a reasonably priced family beach vacation, look no further. Disclosure: We were provided our stay at Waterscape in return for sharing my opinions with you all. As always, these opinions are 100% my own. 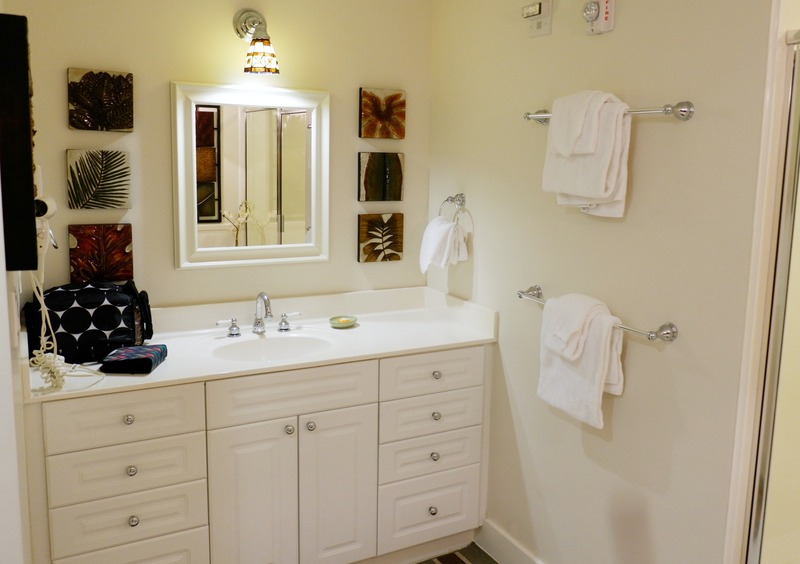 Beautiful photos of the resort, very detailed info about the amenities, and great look of your overall experience. 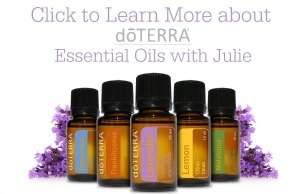 Great post and i love it!